A single-vehicle crash along U.S. route 150 near Muncie (west of Oakwood) early Saturday has claimed a life. Vermilion County Coroner Jane McFadden says 27-year-old Tyler J. Baker of Oakwood was pronounced dead at the scene. 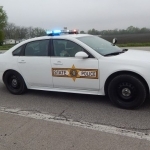 Illinois State Police say the crash occurred at 12:15 a.m. (on March 23, 2019) when Baker’s eastbound pick-up truck left the highway for an unknown reason and hit a ditch. Troopers say Baker was killed when he was ejected from the vehicle as it overturned. Coroner McFadden adds an autopsy is scheduled for Monday, and says the crash remains under investigation by her office and Illinois State Police. The location where the crash occurred is about a half mile west of CR N. 600 East Road – just east of Muncie.